Before I moved into my townhouse here nearly eight years ago I got rid of a lot of stuff so I wouldn’t have to move everything – furniture, clothes I was sick of, books and knick knacks. I didn’t *think* I had a lot of stuff but it’s amazing how things accumulated after 5 years in my old apartment. It was time for a pre-move purge! And while I was sorting through my stuff I noticed I have a love of spirals in my home decor! Wrought iron spirals under the old glasstop coffee table. Wrought iron candlesticks with spirals and a leaf pattern woven in. Spirals on the sides of the plant stand I decided to keep and have still today. And there are some under a glass top side table I held onto as well. Guess I was in a wrought iron phase too! I replaced some of the old, scary dark brown wood doors in my townhouse and realized I needed new hardware too. What did I choose for my new bi-fold coat closet door? Yup, a thick, brushed nickel spiral. Once again, I zoomed right in on the details…the accessories. This is why I sometimes struggle and procrastinate when making big purchases like new furniture. I can walk into a furniture store and not “see” any furniture. Rather, I immediately notice the beautiful ivy topiary on a side table, or a gorgeous throw on a leather ottoman. And look at those candlesticks and that lamp! I’ve likely written about this before – guess it’s just an odd quirk. I thumb through a Silpada jewelry catalogue and what jumps out? A gorgeous, chunky bracelet of linked spirals. Someday this beauty will be mine. And in the same flash of a thought I remember my lifelong love of astronomy. Gazing at the stars and learning the constellations. 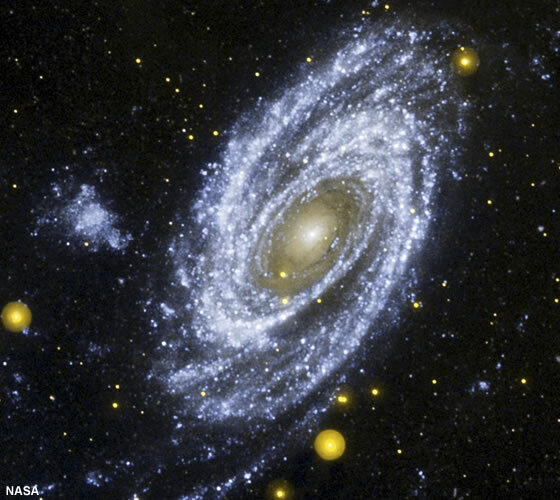 All the galaxy types, including…the spirals. The largest spirals of all. And I learned our Milky Way galaxy is a spiral. Our own ginormous neighborhood in the grand universe! We LIVE in a spiral! I can thank my 3rd grade teacher for igniting this passion within. I remember the flutter in my stomach all those decades ago when she announced we’d be doing a study unit on astronomy. I didn’t know why I felt all giddy – I didn’t know anything about astronomy except I knew I liked looking at the stars and wondering, dreaming. She struck a chord alright. Mental downtime was top priority last night. Work is moving fast and furious. I love the pace but also need time to recharge. And we’ve had a really bad flu bug going around our building – for the last two weeks I’ve had low energy, feeling a little nauseous and maybe slightly feverish. I even missed our team potluck earlier this week [I had a huge batch of orzo pasta salad with fresh basil and tomatoes ready to share]. I was so exhausted and the thought of being around tons of food at that time was not a good idea. When I lose my appetite I know I’m not well. But thanks to technology any of us can work from home if we need to. Anyway, finally, FINALLY I’m over that and back more on my normal stance. What was last night’s mental downtime? Bravo TV to the rescue…Real Housewives of Beverly Hills (these ladies are fabulous! ), and easy comfort food: bowtie pasta with a light tomato sauce and a blob of pesto, and a nice glass of pinot grigio. Lit the 3-wick candle on my hearth and plopped down on the couch. Ahhh. Later, I pulled out my DVD set of the Cosmos TV series. This TV series was shown on PBS way back around 1979 or 1980, hosted by the late, great Carl Sagan. I remember watching this series Sunday nights with my Dad – I was a young teen and devoured every second of it. And it was special bonding time with my Dad too as he was really into it. “Billions and billions…” Sagan’s signature phrase that’s even crept into some mainstream speak. Carl Sagan is a freaking genius. And that TV series was soooo far ahead of its time. Some of the theories, special effects and set designs are a little dated, but most content still holds up today. I think I choked up when I learned he’d passed away after a tough battle with cancer back in the mid 90s. I know I had him named in one of those Facebook “pick 5” quizzes that was floating around awhile back…something like “if you could pick 5 dead people to invite over for dinner who would they be?” Who was on my invite list? A wonderfully eclectic bunch: Carl Sagan, Margaret Sanger, Jack Kemp, Carolyn Besette Kennedy and Johannes Gutenberg. Do you know who these people are/were? A couple may not be so well known…Sanger was a birth control activist in the early 1900s (talk about an uphill battle, hmm), and Gutenberg is credited with inventing the first printing press. A movable type machine. Probably THE most profound invention of our modern era. Can you imagine the dinner conversations between those 5? One of the Cosmos episodes talks about galaxies, the Big Bang theory, black holes, cross-dimensional time travel (do worm holes exist within our own universe or perhaps as links to others?) and other profound thoughts. Funny how thoughts at work are a good-tired for my brain after a full week, yet thoughts about our universe, galaxy collisions, black holes, and trying to understand Tesseracts are to me…relaxing. The majestically moving galaxies…we’ll never notice any such movement in our mere blip of human lifetime, but computer animation shows the profound changes. A billion years can be demonstrated in 30 seconds. The spiral galaxies twist and turn ever inward. But what happens to the stars and planets (and life??) in their centers? Is there an End to the spirals, or do they continue inward forever? I guess THAT is what fascinates me about spirals. What mysteries and secrets do they hold deep inside? As Sagan so simply states the profound, “…the laws of physics apply everywhere.” This means a spiral galaxy with billions of suns turning, twisting inward…is exactly the same motion as water swirling down a lowly shower drain.